Salmon teriyaki with seasonal mixed vegetables over rice. Jambalaya with cornbread and sautéed greens. Chicken vindaloo with mint yogurt sauce and papadums. Japanese dry curry with rice and boiled eggs. More and more people have meals like this for lunch. They’re fresh, healthy and balanced. They satisfy the belly and the heart. They make us pause, enjoy lunch (even if it’s just for 10 minutes!) and feel refreshed. A meal like this feels like it was made with care, with attention to flavor, comfort and nourishment. A meal like this deserves to look as good as it tastes, to be crisp and clean, not mushy or soggy or mashed together. The best way to bring these homemade lunches to work or school are to take them in a lunch jar, like the Classic Stainless Lunch Jar (SL-XD20) by Zojirushi. The Classic Stainless Lunch Jar is perfect for transporting gourmet lunches, and has some remarkable features. 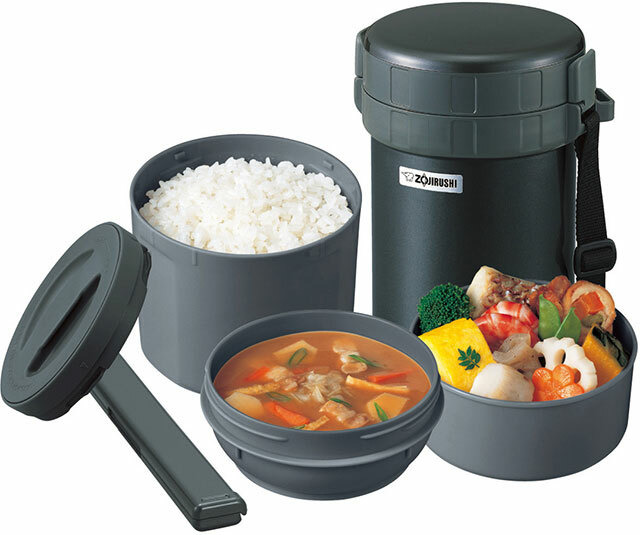 The outer container is made of durable 18/8 grade stainless steel with superior vacuum insulation, which keeps food hot or cold for up to six hours. 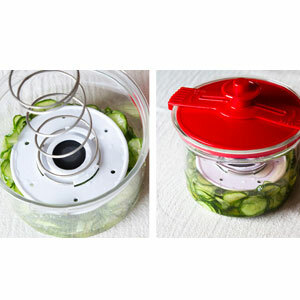 The jar also has three generously sized inner containers – one for a side dish, one for a main dish, and one for soup. 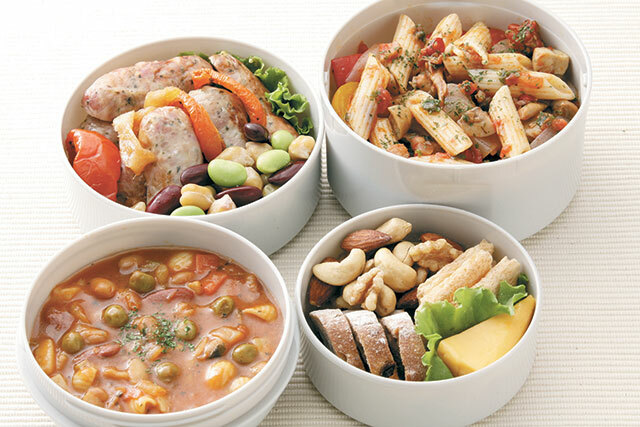 The main dish container has an insulated lid that prevents room temperature items placed above it from becoming heated or chilled, while the soup and main dish containers are kept hot or cold by the insulated jar! Each inner container is microwaveable and BPA-free. The jar also comes with chopsticks, chopsticks case, and a detachable carrying strap. You can find out more on our product page. We’ve got great ideas about what to have for lunch. What are yours? Have you ever been to a Japanese supermarket and gone to the kitchenware section? Maybe you were looking for chopsticks or a good knife or a bamboo mat to roll your own sushi? 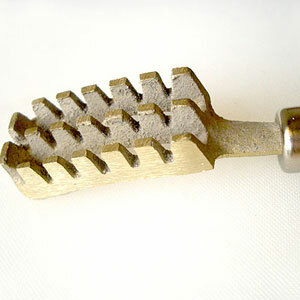 I’ll bet you came across some strange looking paraphernalia that caught your eye, and you wondered, “what the heck is that for?” If you think some American kitchen gadgets are pretty strange, take a look at some of these inventions that were made specifically to do a task needed for Japanese cuisine. If you get serious about going Japanese, you gotta get one of these! Rice Washer There’s no way you would know that the device above is for washing rice if you saw this tool all by itself. 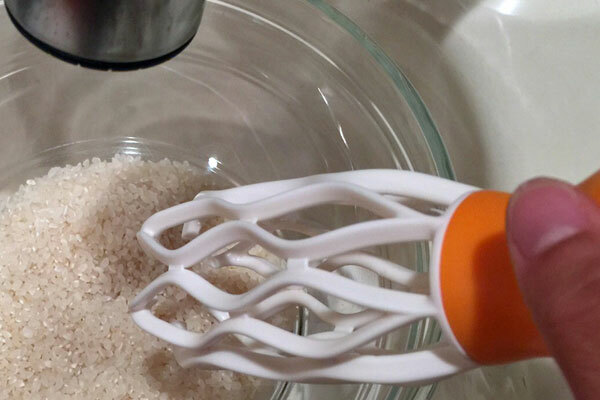 The plastic helix-shaped whisk even unfolds so it can be washed thoroughly from the inside-out. Not only does it save chapped hands, it’ll save your nails too, when faced with this almost daily chore in a typical Japanese household. The Gyoza Press Homemade potstickers anyone? 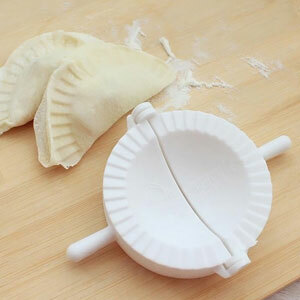 This clamp crimps the dough to make perfect little potstickers. Just lay the wafer-like dough on the press, fill with filling, and fold over. Beats making a lopsided one by hand, right? 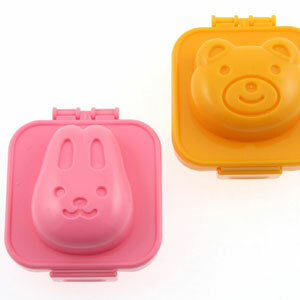 Egg Molds Create animal shaped eggs for your kids’ bento lunches! Boil an egg, place in mold when still hot, then close. Leave in cold water for a few minutes while your egg cools, and out pops a hard boiled egg bunny! 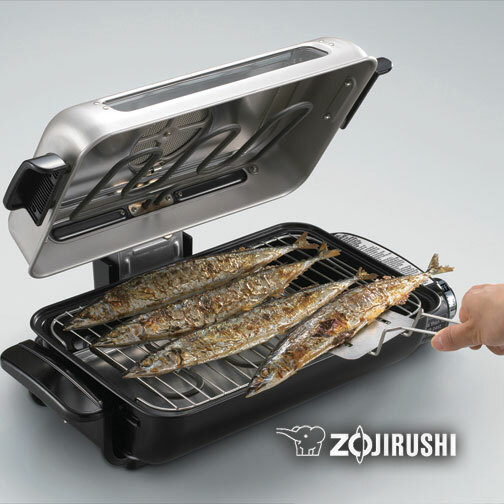 Fish Roaster This handheld grill is made to roast fish on your stove top, which many Japanese families do, instead of over a charcoal grill. It does a remarkably nice job–just keep your vent fan on high! Donabe This earthenware pot is usually used to cook hot pot dinners on a hot plate at the dining table. 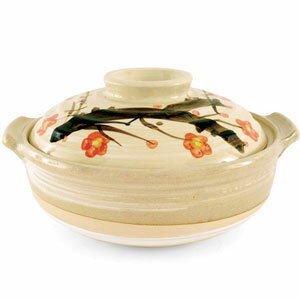 These pots can be fairly expensive and very exquisite, especially the authentic Japanese ones handcrafted by artisans. They’re as much a tabletop centerpiece as they are a cooking vessel. Here’s a Chanko-nabe recipe from the Zojirushi site. 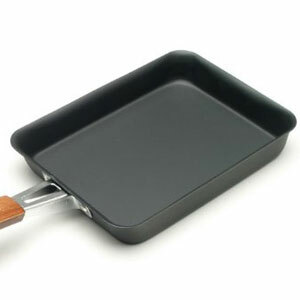 Omelet Pan This rectangular pan is used specifically to cook omelets in this shape. They are then rolled and sliced into the egg toppings for sushi. Takoyaki Maker No, this does not cook eggs, even though it looks like it. 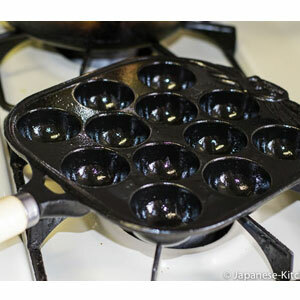 Each cavity in this unique pan makes a ball of batter flavored with chunks of octopus, known as takoyaki, or octopus balls. 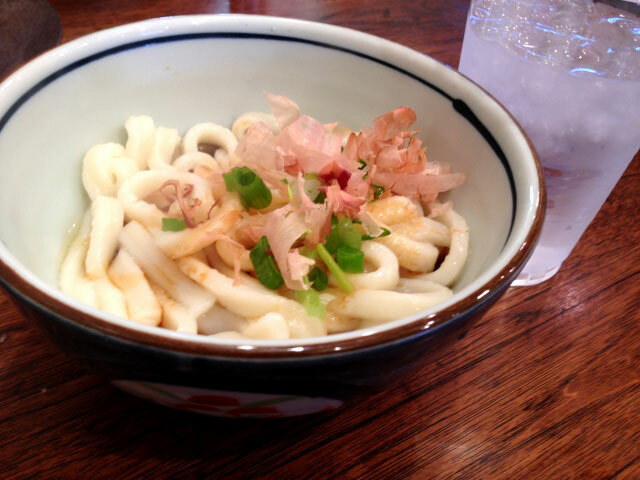 The doughy snack is a favorite of Osaka. 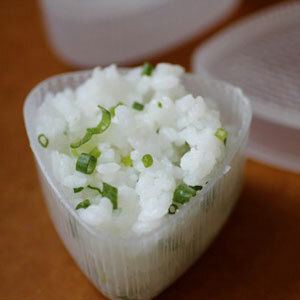 Onigiri Mold In the old days, homemakers used to be adept at shaping rice balls into triangular shapes without the aid of a mold. My Mom used to make them this way, and the one advantage was that she would dust her hands with salt so she could flavor our onigiri. But you can’t beat modern conveniences, can you? Fish Scaler You may never find one of these in an American kitchen, but many home cooks scale and clean their own fish in Japan, where it is often bought whole and fresh at the market. Okonomiyaki Spatulas These odd looking spatulas were created specifically for flipping okonomiyaki, sometimes known as Japanese style pancakes. Usually used in pairs so you can get underneath both sides of the pancake, you deftly flip the whole thing when one side is done cooking. 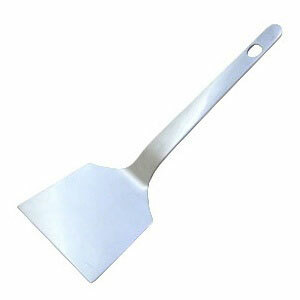 Also used to slice it up into smaller pieces. You can find a Zojirushi recipe for okonomiyaki here. Pickling Press Japanese pickles, known as tsukemono, used to be made in large ceramic pots. The vegetables, whether cucumbers or cabbage or eggplant or other, was placed in a pot with fermenting ingredients and pressed down by the weight of a heavy stone to get the excess liquid out. These modern presses are much easier and don’t require heavy lifting. Sukiyaki Pot Another tabletop favorite at Japanese households, especially when celebrating special occasions, is sukiyaki. 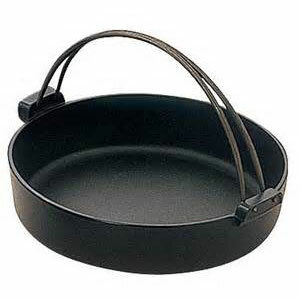 This cast iron pot keeps the broth bubbling as it continuously cooks over the hot plate at the dining table. Try Zojirushi’s sukiyaki recipe. 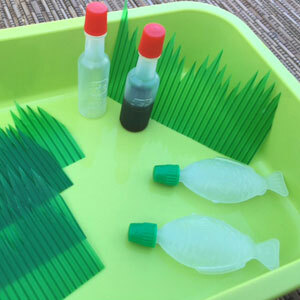 Bento Accessories You may think, “why do I need plastic grass?” but if you want to make authentic Japanese bento, you need plastic grass to separate the food inside your bento box. It’s used to keep the flavors from mingling and as a decoration. The tiny disposable vials are for soy sauce. Look, little fishies! 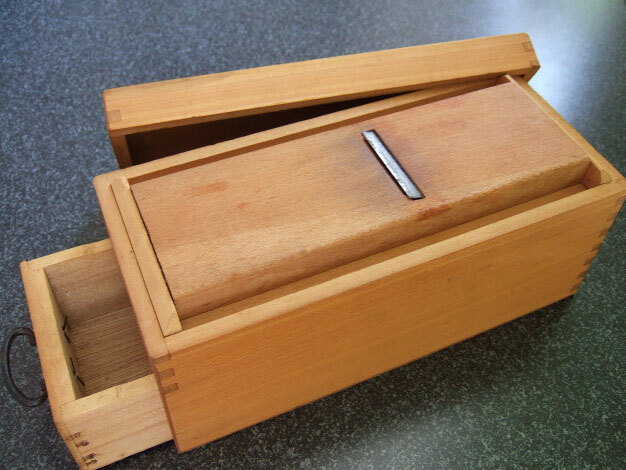 Katsuobushi Shaver A carpentry tool in the kitchen? No, but close to it. Cooks who take their umami seriously might insist on shaving their own dried bonito, otherwise known as katsuobushi, a prime ingredient of soup stock and source of the savory 5th taste known as umami. Smoked and dried bonito can be bought in chunks, which is then shaved into flakes with this wooden planing tool; or you can simply buy it by the bag at a grocery store. Katsuobushi is an important ingredient in Japanese cooking; see how to make your own soup stock here. Guess what? Almost all of these tools can be found at your local Asian supermarkets if you have one, and if you don’t, I’ve seen them online too. Part of what makes cooking fun is getting to use all these gadgets, right? Ah, summer! What a glorious time to be in and out of the kitchen! Seasonal ingredients are abundant and warm weather has us eating light all season long. We have as much fun hanging out on lazy weekends as we do eating, so why not make it that much better? We have developed a product that takes all the fun and flavor of a summer roast, and condenses it down to the size of your countertop; saving you on space, smells and clean up! 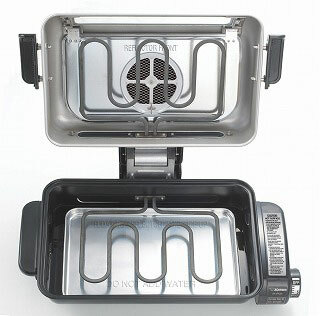 Our Fish Roaster (EF-VPC40) is the perfect tabletop appliance for creating quick and delicious roasted foods. From omega-3 packed fish to protein-rich chicken, pork, and beef—just throw them in the roaster and you’re ready to go. Don’t forget to add vegetables, too! Delicious roasted vegetables make the perfect summer side dish. This product comes equipped with a platinum catalytic filter that will eliminate up to 90% of smoke and odor components by chemically decomposing them. There’s no need to flip food thanks to a powerful 1,300-watt heating element on top and bottom, and the heat reflectors ensure a crisp finish. An extra wide roasting rack can accommodate large fish, meats, and vegetables up to 13-3/4” in width, and a stainless steel roasting rack will direct excess oils and fats away from foods. Simple disassembly means clean-up is a breeze as well! 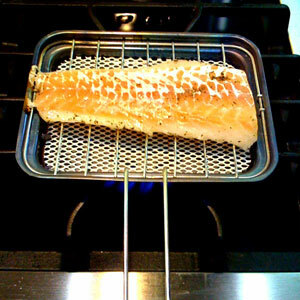 Come check out our recipe page and discover what you can cook in this wonderful fish roaster. Make it your own and keep those summer vibes cookin’ all year long! 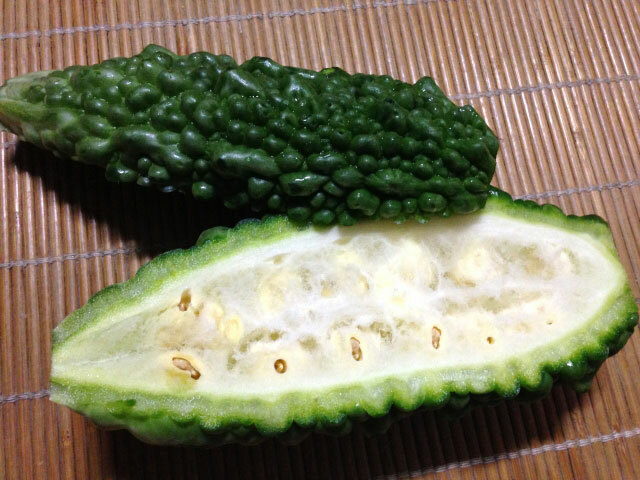 Goya, or the bitter melon, is a favorite in Japan this time of year. With its pebbly surface and long green shape, it resembles a prickly cucumber or summer squash more than it does a cantaloupe or honeydew melon. Don’t be fooled by its cute name, either. “Bitter melon” is not a playful title for the latest Jolly Rancher. This unusual fruit really is bitter. So why is Goya so popular despite of its bitter flavor? Well, it’s because these funny little fruits are packed with vitamins, minerals and healing properties that might just help you fight through the hot and humid summer in Japan. It’s also believed that they may help improve your skin texture and digestion since they are high in Vitamin C and fiber. With that bitter taste, they are almost like a medicine! Although you can find them pretty much in any supermarkets in Japan during this time of year, you can also grow them in your own back yard! With seeds purchased online, mulched soil and plenty of sunshine, these funny fruits will be abundant in no time. Scared to try? Don’t be! You can pair this ingredient with savory bold flavors like soy sauce, bonito flakes, and onion. You can also add it to a noodle or fried rice dish for an unusual treat. Be adventurous and let us know how you like this funky ingredient! Katsuobushi or bonito flakes are a staple of the Japanese cuisine. These salty-smoky, light as a feather, umami packed flakes are often sliced so thin, they dance or wiggle on the surface of the dish. It is also the main ingredient in umami rich dashi stocks, a key ingredient in many Japanese dishes. The inimitable bold and slightly fishy notes of katsuobushi will add depth and complexity to any ingredient. These days you can find a bag of bonito flakes in just about any Japanese/Asian supermarket for a few bucks. So why shave your own you ask? Well, you know the difference between freshly shaved Parmesan cheese and the kind that comes pre-shaved and lives on the shelf for eons? That’s why! Shaving your own katsuobushi requires a little bit of finesse, but will yield you a finished product that is so far superior to the pre-shaved ones in the bag that you will never want anything else. All you need is a block of dried katsuo (bonito) and a katsuobushi kezuri, or shaver. product will be well worth your time! We found this beautiful video of a master at work here to help inspire you. Enjoy! 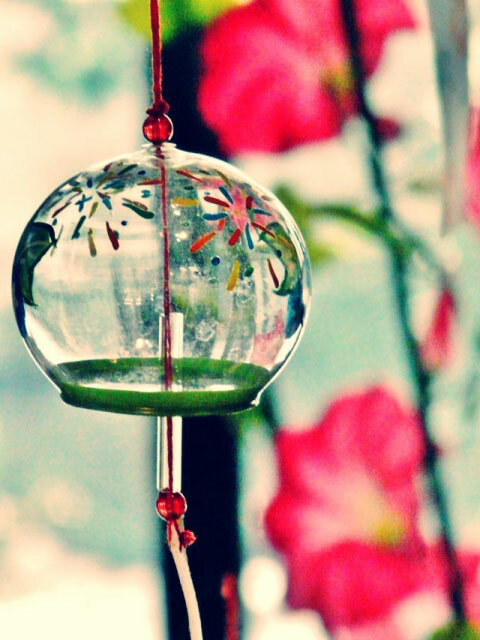 In Japan, our wind chimes are quiet, small and made of glass. First introduced to Japan by Chinese monks in ancient times, these chimes were originally used to watch the strength and direction of the wind. Their soft and peaceful sound was quickly given new meanings in Japan. Adopted by Japanese temples to ward off evil and keep people safe, they were hung on all four corners of the temples. It was said that if you hear the furin, no disgrace will occur. These chimes were originally made of copper, later glass and today, even pottery. Over the centuries we have become more creative with the design of furin, making them in unusual shapes and sizes. You can even find branded furin with popular Japanese characters like Hello Kitty. Their peaceful sound and small size make them a favorite in Japanese homes and apartments, and help people relax during the hot summer months.